Situated in the heart of Belgravia, you find The Goring. With the likes of Lady Churchill and various royal families allowing themselves to be charmed by a stay here, this award-winning hotel is still very attractive with its understated luxury. A cozy fireplace sparkles and glows and you are greeted with a friendly welcome, in typical British style, as you enter the Edwardian dining room, where other guests are waiting at their tables. Elegant three tier platters are placed throughout the room, laden with scones, homemade biscuits and small stylish sandwiches. Plates are placed, together with elegant china, on the tables in front of guests, who’s eyes follow every step full of anticipation. The clock has just struck three and it is time for afternoon tea at The Goring. The room quickly fills up, which proves that this quintessentially English ritual has not become outdated. Tea is served with accompaniments in the same way it has been served since the hotel opened its doors 100 years ago. If you want a little extra “punch”, order Bollinger afternoon tea and you also get a glass of champagne and some fresh strawberries . A discrete ban on mobile phones and laptops means all guests enjoy afternoon tea without the distractions of modern technology and everyday life. There is warm and joyful conversation around the tables, which will soon be adorned with tea, biscuits and champagne. This soft elegance characterises the hotel. From the moment you arrive and you are met by an elegantly dressed doorman, you feel the history and charm in the beautifully decorated walls around you. Although the style is archetypal British and very classic, the hotel feels by no means rigid or snobbish. To the contrary! Here, as guest, you are treated with kindness and openness. The Goring has the feel, in many respects, of a visit to a luxury villa in the countryside, along with a touch of Downtown Abbey! In the lobby, you meet the hotel’s founder, Mr. Goring, but only in the form of a bronze statue. 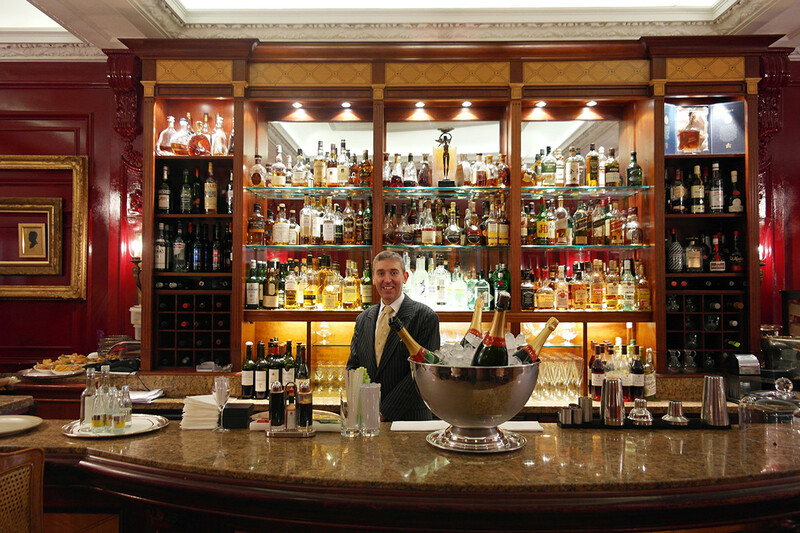 Today, the fourth generation of the Goring family owns and runs the hotel. Mike, one of the employees who showed us to our room, says that the hotel’s goal is to retain their original style and not let themselves succumb to current modern trends. 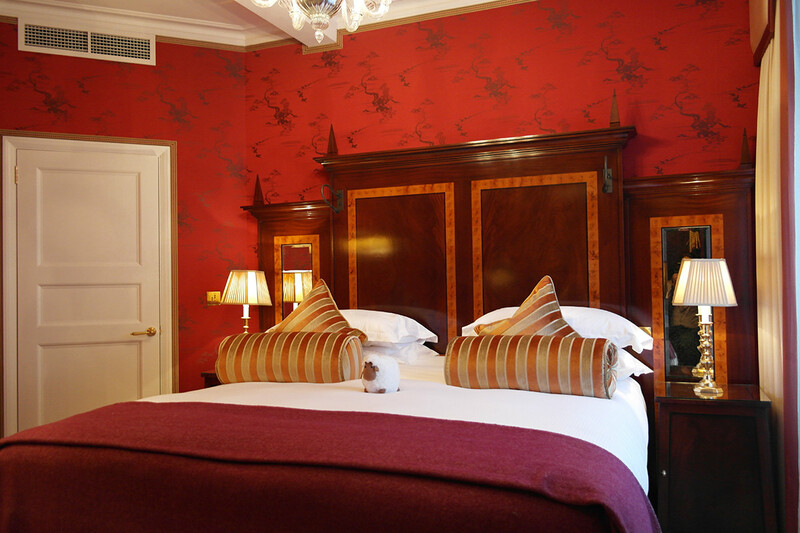 The rooms are all individually decorated by famous English designers, such as Nina Campbell and Tim Gosling. They have traditional English marble bathrooms, with cutting edge technology, blended with a traditional interior and extremely comfortable beds. The hotel’s cheapest standard rooms are not particularly large, but are impeccably decorated and you still get a lot of quality for your money. The hotel’s suites, a little higher up in the house, are like small luxury apartments and include an entrance, a separate living room, with a sofa by the fireplace, bedroom and bathroom. Exclusive historic wallpaper and silk, from Gainsborough Silks, contribute to the luxurious feel. 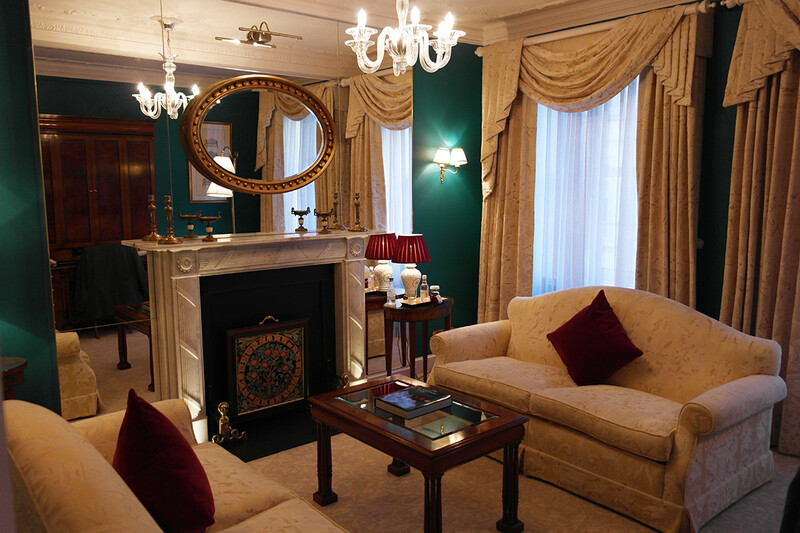 The Royal Suite is the hotel’s crowning glory. It extends across the whole of the top floor – and no expenses have been spared! The suite is filled with antiques collected from all over England, and the silk tapestry on the walls are of the same kind that adorned the first class dining room on the Titanic, in 1912. Many of the rooms and suites have views overlooking the garden, the rest have views of Victorian Square or Beeston Place. Some rooms also have a private terrace. The hotel recently got a lot of publicity in the media when the Middleton family chose The Royal Suite, at The Goring, for an overnight stop before the royal wedding. However, one need not be either royal or suffering pre-wedding nerves to be taken care of in the best possible way. Maybe it was the hotel’s peaceful atmosphere that won the royal choosing, The Goring would definitely be a calming place to take a breather on the eve of such a thrilling day as a royal wedding. The Middleton family are not the first prominent guests the hotel has had. Winston Churchill was a frequent guest here in his time, and his mother, Lady Churchill, lived here for a short period after the First World War. Royalty from all over Europe have come and gone since the hotel first opened its doors in 1910 – one famous visit was from the Norwegian Crown Prince, Olav, who was a very satisfied guest in 1937. It is said that he was particularly pleased to have his own bathroom, as at Buckingham Palace he would have to share a bathroom with five others. The dining room is large and pompous, with Swarovsky crystal chandeliers, and is decorated by the renowned designer, David Linley. The menu is taken from traditional English cuisine. Luxurious, upgraded variants of grandma’s specialties are prepared with specially selected raw ingredients. We were waited on by a very skilled and attentive sommelier, who seemed to enjoy his job very much. He was more than happy to share his knowledge and enthusiasm. The restaurant has an impressive wine list and is one of the few that also offers wines ‘en primeur’, so guests can buy good, aged wines at sensible prices. There is a twinkle in the eye of the employees, they are personal, you feel welcome and very well taken care of. The a la carte breakfast is also served in the dining room. It is a great breakfast menu, whether you want a sensible and nutritious start to the day … or a little more of a, should we say, heavy start. Again, it is the raw ingredients that are the focus and the Clarence Court Eggs ensure that the scrambled eggs will be an experience in themselves. The fruit salad is not drenched in sugar, but served fresh and topped with delicious fresh berries. Here, no one leaves the table hungry. One can order a three-course breakfast, Continental or British style. Slightly melancholic, we left the hotel, although we were safe in the knowledge that we will be back one day. If you are one of the many who have let yourself be seduced by the TV series Downtown Abbey, and if you dream of a large house in the country, then yes, you will also feel that you have found your second home at The Goring – just as we did! Strengths: The Goring is ideal for adult couples, for those who want to know the history contained in the walls, as well as those who want a quiet base to come back to after the experience of a big city. Weaknesses: No obvious faults. Maybe this is not the place where people go with their friends, and if you are looking for extreme cuisine with dishes that provide unexpected flavour combinations, then maybe you should choose another place to eat. Do not miss afternoon tea between 3pm and 4:30pm. A great example of British culture – but remember to book a table. The Cocktail Hour, from 5pm, is also worth a mention. The hotel’s most famous cocktail, a paradisiacal Cosmopolitan, can also be ordered to your room. If you like The Goring, please also check out our review of another very nice hotel in the same area, the more intimate Hotel 41! Back to "The Goring Hotel, London, Storbritannien"